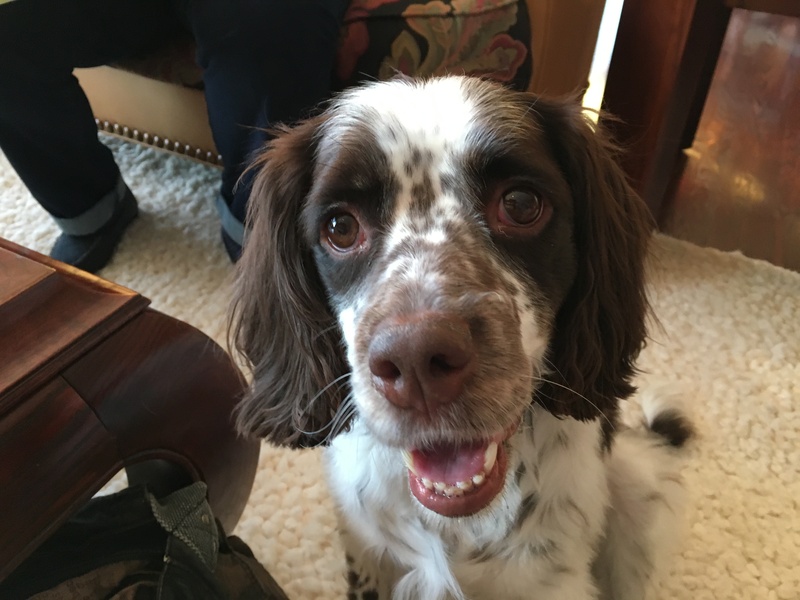 Zoe is a three-year-old English springer mix who is fearful of new people, tries to run out any open door and barks like crazy when guests arrive or come inside, especially so if the visitor is male. One visit from a repair man was accompanied by two solid hours of Zoe’s barking. Zoe was more than happy to give me an example of her over-barking behavior when I arrived for the session. Zoe was barking to communicate that she disagreed with my arrival and remaining inside the home. This is often the result of a dog who lacks rules, boundaries and limits in its day to day life. While many humans think of these are negatives, to dogs, this structure helps them see and develop a respect for the humans as authority figures. I usually like to let a dog get the barking out of their system before I start working with them, but based on my prior conversation with her guardian I knew that wasn’t going to work in this case. I pulled out a leash and advanced on Zoe until she backed herself into the laundry room. Once I was about 10 feet away I stopped advancing, turned so the dog was on my right side then approached in a very slow and non confrontational way until I was only a foot away. I stooped down into a crouch and then offered the leash to Zoe to sniff which she did. Once she had sniffed it enough for her satisfaction, I dropped it over her head and lead her into the living room. Usually placing a barking dog on the leash like this stops a dog’s barking for as long as the leash was attached. Not the case with Zoe. It created a momentary lil in her barking, but she started back up again (although less intensely and with less quantity) after I sat down with her guardian. When a dog is engaging in a nuisance activity, I always look for a way to distract the dog or to use positive reinforcement to change the behavior. But sometimes a dog gets so wound up or into such a routine with a bad behavior that we need to disagree to correct it. At first the dog’s handler’s corrections were slow and lacked the right intensity. But as we practiced, the guardian’s timing and technique improved. I offered a number of suggestions on how the guardian can practice correcting the dog when she started to over bark as well as how to best reward her for not barking. When rehabilitating a dog from an unwanted behavior, repetition and practice are key. There are no entrapment laws for dogs, so setting up a situation that allows you to practice correcting and rewarding the dog for a new behavior is a very effective way to rehabilitate a dog. I suggested that the guardian ask family and friends to stop by so that she can use the positive reinforcement to change how the dog feels about guests arriving. Another big factor, perhaps the biggest, will be for the guardian to assume the role of a leader in the dog’s eyes. Introducing rules and boundaries and enforcing them right away will go a long ways towards this dog developing the proper respect for the authority of her guardian. Once the dog respects her this way, it will be easy for the human to disagree and stop Zoe from her nuisance barking. This was apparent at the end of the session when I tested her response to a knock at the door. Zoe thought she was doing the right thing by barking at visitors until they left. But now that her guardian knows how to communicate what she does and does not want from her dog, it will take practice at disagreeing with good timing along with changing the leader follower dynamic for the dog to adopt a follower mindset and behavior. Once Zoe really feels like a follower, she will knock to alert her guardian to a knock at the door, then step back and let the human take things from there.